Having the tight and beveled edges links close together gives this Men's 23 inch long and 1/2 an inch wide Necklace a super clean and smooth look and feel. 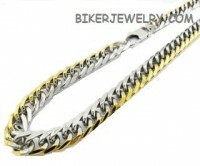 This Stainless Steel Curb Link Necklace is very strong being 316L. Add the touch of gold plating down one side gives this Necklace a look all of it's own. Having a designer lobster claw clasp to give it that finished look.